Happy Comic Release Day! Welcome to the second installment of GeekMom Comic Book Corner, where we recap our adventures in comics for the week. 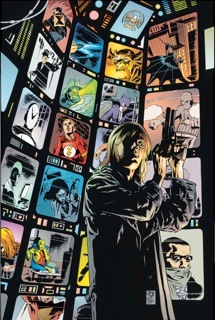 This week I’d like to recommend the newly released trade paperback collection of the Chase series from DC Comics. The book, by J.H. Williams and Dan Curtis Johnson, follows the career of a federal agent for the Department of Extranormal Operations. Her job takes her into conflict with Batman, the Suicide Squad, and other heroes and villains in the DC Universe as she struggles to survive in a world where being normal can get you killed. I knew I’d love this book when the first adventures co-starred Batman and all the Clayfaces. Chase is currently appearing in Batwoman, not coincidentally being written by J.H. Williams. Reading this series brought the character far more alive for me. While looking through my Comixology app for a good Marvel read, I stumbled on their section for new readers. On the list of suggested reading was the graphic novel The Wonderful Wizard of Oz. They say you should never judge a book by its cover, but it was the cover that pulled me in. This was my first graphic novel that was outside of the traditional comic book heroes. The artwork was interesting to look at and called me to read the story. Having never read the actual novel, I was able to just read and enjoy without comparing it to anything. I was unprepared for the story of the Tin Man which depicted his body being cut off piece by piece by his own ax. The story was a little hard to read at that point, but the lack of gruesome art made it easier to handle. At every bump in the road Dorothy overcomes obstacles to help her new friends and find her way home. One of the things I liked a lot about the story was the lack of whining from the characters. They all stayed positive through most of the story and they turned out to be a nice team. You don’t see Dorothy give up or feel very sad about missing her home. Once she learns what she must do to get back to Kansas, she sets out and doesn’t give up. My 6 year old son even found it interesting enough to try and read. Even if he couldnt understand some of the words, the art told the story well enough that he could figure out what was going on. I picked up Avengers Assemble #1 in anticipation of the film opening this summer. The Avengers have the look of their movie counterparts, which help me get a feeling for the characters in their new get-ups. Jeremy Renner can’t rock the purple mask without looking like a fool, I understand, but it’s still hard for me to think of him as Hawkeye. Avengers Assemble #1 brings the team a new headquarters in New York City and a threat in the form of the mysterious group called the Zodiac. The Hulk takes on one of their members in a fight full of “BOOM” and “TOOM TOOM TOOM,” so you know it has to be good. The casual mention of “General Whedon” at the end of the Hulk’s battle still amuses me to no end. The second half of the story follows Hawkeye and Black Widow on a recon mission in Latveria. The two have some great scenes together, trading witty banter until it’s time to call in the rest of the team to take on another giant-sized member of the Zodiac. The Zodiac is an interesting take on a villain group, and they are off to a worthy start as a match for Earth’s Mightiest Heroes. If you’re looking for a new Avengers series to get geared up for the blockbuster this summer, this first issue has some promise for Avengers Assemble. ← Enter Our First GeekMom Video Challenge!